I remember once when my mother gave me a book for my birthday. I cried. I thought that a book must have been the worst birthday gift a parent could possibly give to a child. What was she thinking?! The book she gave me was “The Jolly Postman” by Janet and Allan Ahlberg. And I loved it. Today, I love books and I love reading more than almost anything else. I can think of no better gift than a good book. I have hundreds of books on my shelves, and my kids already have mountains of books even though they themselves are just beginning to learn how to read. They ask me to read to them every single day. My kids probably own more books today than most Togolese kids will read in their lifetime. 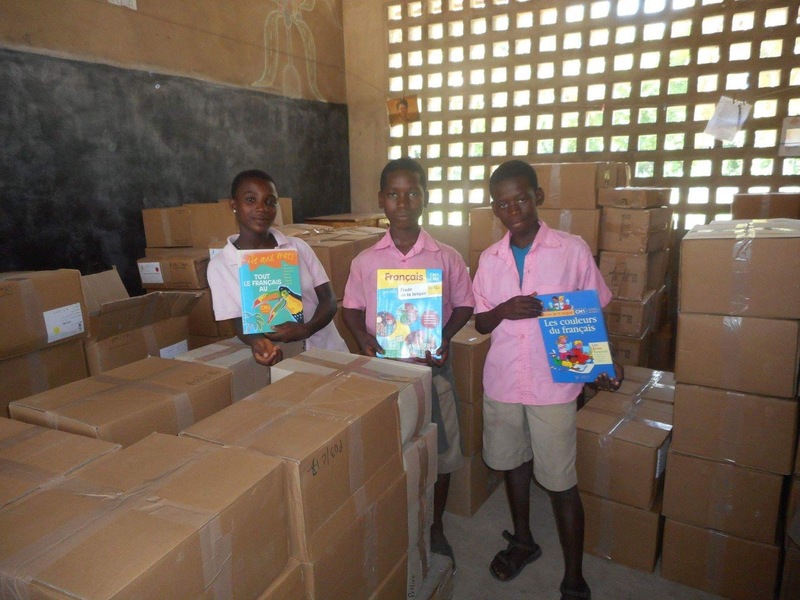 Very few books are available to Togolese kids, and most of the good books are closely guarded and locked away because they are so valuable. It is very difficult for the eacher to help their students become proficient readers when there are so few French books available to them. Today we made a big step in changing the situation. This morning (April 22, 2016) a container filled with thousands of French books arrived for 14 elementary schools and 2 Jr. High schools. This is the first major step in a greater Library & Literacy Project for our Christian schools. 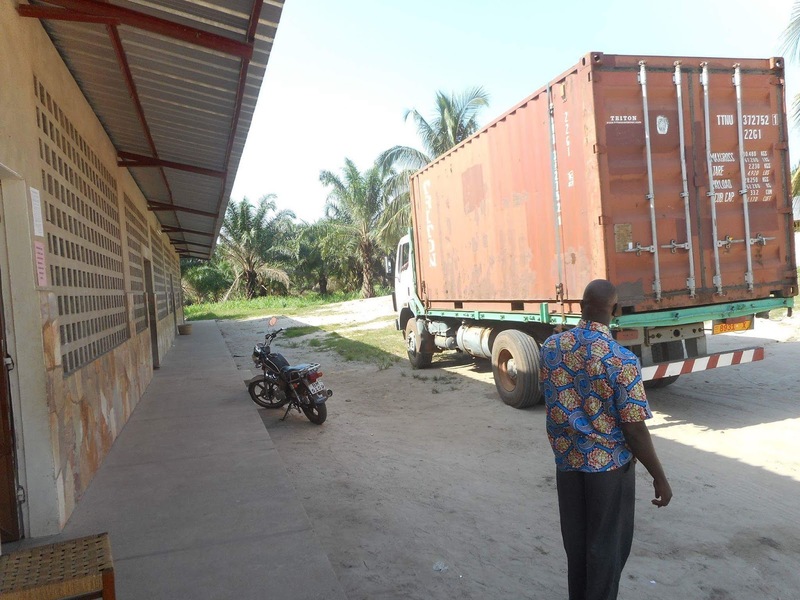 The container of books arriving in Adeta, Togo is just Phase I of the plan. In Phase II this July, a team of librarians from Iowa are coming to train a designated librarian/teacher and the school principal from each of the Christians schools so that they will be able to properly care for the library and help the other teachers and students to use it. Then we will host a literacy seminar for all the teachers in the schools in order for them to know how to best use the new library and to better help the kids who struggle with reading. Phase III involves solving some of the logistical issues of setting up small libraries in 14 different locations around the country of Togo. The Iowa libraries will be leading the organizing and cataloging of each school’s library. We are also buying and constructing bookshelves made to fit each individual school. After the training seminars we will be delivering the books and shelves North and South across the country. In Phase IV we will be converting the 20’ shipping container into a shared library for an elementary and Jr. High school. We will also be evaluating the other school library facilities to see how they can be expanded. Our goal is to help kids to become proficient readers, critical thinkers, and students of the most important book: the Bible. I can’t take credit for this because it certainly wasn’t my idea. And many people have contributed their time and money toward this massive project. We are still looking for help to provide literacy training for the teachers and librarians as well as in converting the shipping container into a library and other construction projects.